These are the same superb oil paints that we use in our studios. Jack Richeson and Co. is justifiably famous for their high quality professional artists' materials. Thirteen color set includes a warm and cool of each primary color plus a few other colors we find essential for our palettes. 1.25 oz. tubes. Set includes: Cadmium Red Scarlet, Alizarin Crimson Permanent, Cadmium Yellow Medium, Cadmium Yellow Light, Cobalt Blue, Ultramarine Blue Deep, Quinacridone Rose, Transparent Red Oxide, Burnt Umber, Yellow Ochre, Viridian Green, Ivory Black and Titanium White. 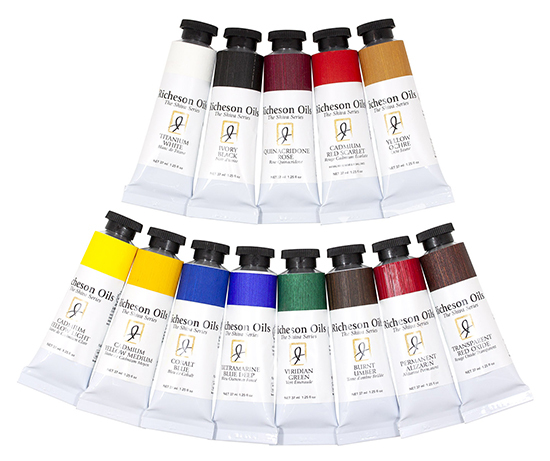 Click the button below to add the John Hulsey Oil Paint Set by Richeson to your wish list.